Do you find yourself constantly asking your child to "pick up the pace"? Does he or she seem to take longer than others to get stuff done - whether completing homework, responding when spoken to, or getting dressed and ready in the morning? Drs. 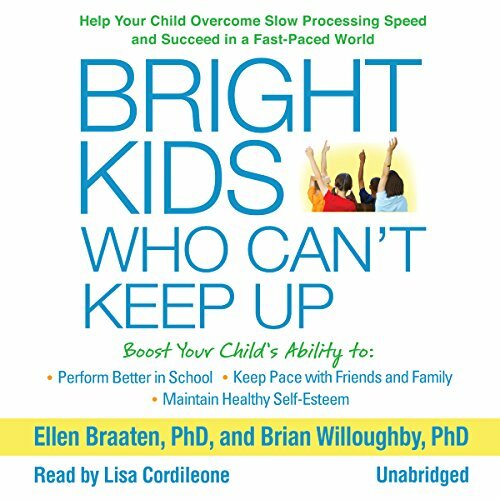 Ellen Braaten and Brian Willoughby have worked with thousands of kids and teens who struggle with an area of cognitive functioning called "processing speed" and who are often mislabeled as lazy or unmotivated. Filled with vivid stories and examples, this crucial resource demystifies processing speed and shows how to help kids (ages five to 18) catch up in this key area of development. Would you listen to Bright Kids Who Can't Keep Up again? Why? Our son was diagnosed with ADHD at the end of 6th grade along with slow processing speed. This book gave us so much great information . What did you learn from Bright Kids Who Can't Keep Up that you would use in your daily life? Give a one specific task at a time to complete instead of trying to giving him 3 or 4 things to complete. Read this book and understand processing speed! So helpful to all parents whether your child seems to be a "step" behind or not. With all of the academic, behavioral, cognitive and emotional challenges our kids face, this book addresses the processing speed to which we all have and how it can relate to a child's issues. Invaluable information. If you are a teacher or parent, read it now! It will save you and the kids in your life heartache. I enjoyed the book except I felt like it was lacking. I was hoping for my techniques of how to help those with slow processing speed vs just hearing examples of what slow processing speed is. Boring, unhelpful. Wish I could delete it from my Audible library. I suppose lost self help books are pretty bad, but I would put this toward the bottom of the heap.